Who else gets tired of their Christmas tree ornaments from previous years? I mean, I would love to change out my tree decor every few years but we all know that is just not practical or economical. No, I’m not talking about the special ornaments that you have collected over the years but the fillers you buy in bulk that anchors your color scheme. With my undying love of Red and Gold, it is anyone’s guess on how many I’ve of those. They are good and will do the job but seeing them year over year is just blah. So this year I’ve decided it is time to update! My goal is to freshen up my old ornaments and make them fun and unique. And what’s more fun than a Santa belt? It is already a big hit with the kiddos. The best part is, it is super simple to make. Ready for some glitter action? Start off by drawing the outline of the belt buckle on the ornament with a Sharpie. Doesn’t have to be perfect, just a rough outline. It is going to be covered by glitter anyway. Align a piece of painter’s tape (enough to go around the ornament) to the horizontal line of the inside square of the buckle. Repeat for the opposite side. You’ll now have a horizontal stripe around the ornament. Paint Mod Podge only on the horizontal stripe around the buckle and the inside square. Leave the 2 vertical bars on either side of the inner square empty as that will be gold. Keep the ornament over a paper plate and gently pour Black glitter over the glue. Using a pipe cleaner hang the ornament to dry. As you can see my dining room chandelier comes in handy for projects like these. I had earlier done the same thing for my vintage lace ornaments. When dry repeat one more round of Mod Podge and glitter so that you get even coverage. Black glitter is usually very fine so it is tough to get good coverage with one application. Once it dries gently peel off the tape. Now, paint Mod Podge over the rest of the buckle i.e. on the outer square. Gently pour Gold glitter over the Mod Podge. Gold glitter is denser so I could get away with one coat this time. Hang to dry as in previous step. Wipe or blow away excess glitter from the ornament and it is ready to hang! Wasn’t that a great update? My other 12 Days of Christmas Ornaments: Sunburst Mirror Ornament, Glitter Swirl Ornament, Terrarium Ornament, Cork Ball Ornament, Woodland Reindeer Ornament. See ya back tomorrow for yet another fun project. 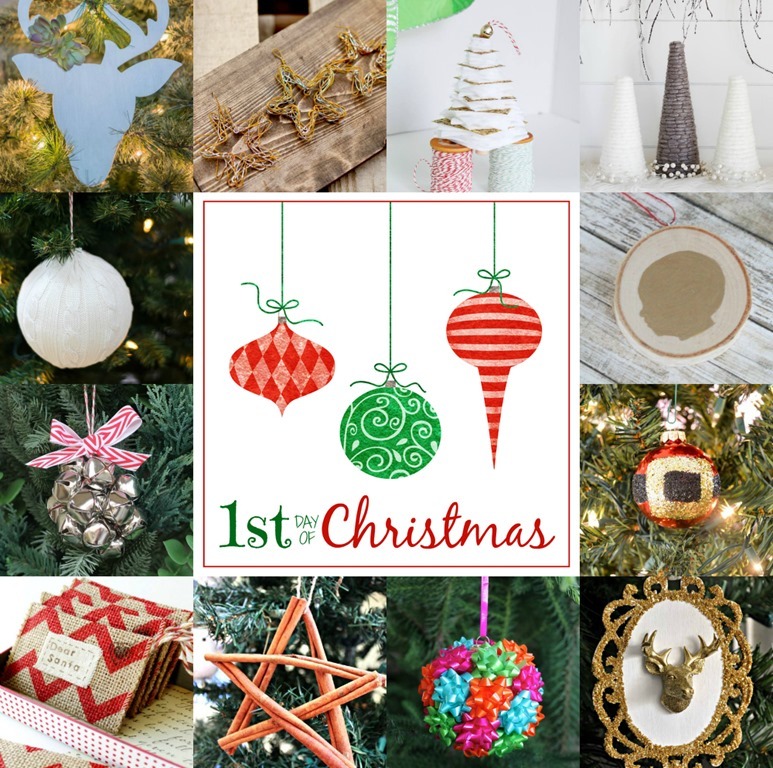 In the meantime don’t forget to checkout my other 12 Days of Christmas friends and their awesome handmade ornaments. A big shout out to Michaels for gifting each of us a little gift card to help offset our supplies for this series. Find more crafting ideas from Michaels on their Facebook, Twitter, and Pinterest pages! I am in love with this ornament! Cute & sparkly! Thank you Linda! Thanks again for organizing this. So glad to be crafting with you talented ladies! That’s an awesome update! My son loves anything Santa, he would go crazy for this. Happy to be Christmas crafting with you. My kids love it too. Even got a thumbs up from my “hard to get compliments from” our of 6th grader! Darling!!! And I LOVE anything and everything with glitter! What a fun, cute idea! This could be a great one to get older kids involved with too! Love this! Seriously so cute! Such a super cute DIY – love it!